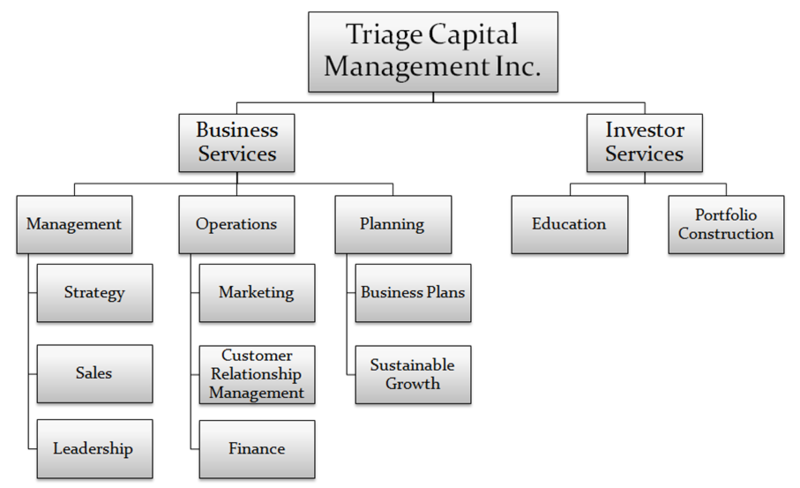 Triage Capital Management was incorporated in January 2009 and took ownership of the independent consulting business of company president Brad Ferris. Inspired by his background in nursing Brad chose to include the word “Triage” in the corporation’s name because of his belief that businesses and investors need to recognize the importance of setting priorities based on need. Triage Capital Management Incorporated provides products and services to individual businesses, institutional investors and private investors with a mission of involving each client in the consulting process. Other consulting companies provide solutions to clients by simply providing the missing piece of a puzzle; at Triage Capital Management we help our clients create the solutions they need themselves. This approach ensures that the needs of our clients are met 100% and tailored exclusively for their use. We focus on educating our clients through sound fundamentals, involving clients in each essential step of the process and enabling them to make the decisions that matter. Our corporate services offer businesses and investors a number of tools to assist them in progressing forward with their individual needs, immediate challenges and long-term vision.